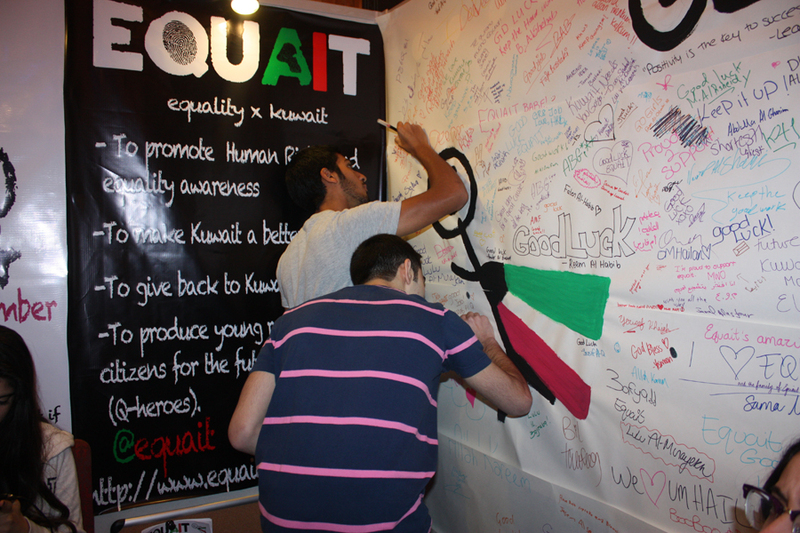 Equait (Equality x Kuwait) is a youth initiative launched 3 years ago to tackle racism among young Kuwaitis. The project aims to encourage dialogue and show solidarity with migrants through public events and gatherings. In addition to challenging the normalized denigration of domestic workers, the youth-to-youth project is critical of Kuwait's migrant policies such as the sponsorship system. In the following interview with co-founder Faisal al-Fuhaid, Migrant-Rights.org discusses the project’s current and prospective activities. Migrant-Rights.org: Can you give us a brief overview of Equait’s work? Equait is a youth-driven organization founded by Leanah Al-Awadhi and myself and is associated with the Global Changemakers program and the We Are Family Foundation’s Three Dot Dash program, where I am an official Global Teen Leader. Equait works to promote social equality and respect towards Kuwaiti residents from all walks of life. 69% of Kuwait’s population is expatriate and some of them are seen as occupiers rather than residents. Through events like Model United Nations, food rallies, walkathons, and youth workshops, we aim to make Kuwait a more tolerant and accepting environment. So far, we have recruited over 230 Q-heroes (volunteers), received over 200 individual delegate applications for Model United Nations, and distributed 613 lunch-bags to 18 areas all across Kuwait for the needy during our most recent Ramadan food giveaway. We are also expanding our program internationally through our partnerships with other organizations, such as the International Peace Youth Group based in South Korea. MR: It seems that you primarily target Kuwaitis and Kuwaiti youth to encourage them to question discrimination against non-citizens. How do you promote this discourse? Well, we personally feel that as Kuwaitis, we take many things for granted and that includes the workers that have traveled a long way to clean our streets, look after our children and take care of our homes. Most Kuwaitis are under the impression that once the migrant workers are under their power, they can do whatever they want to them and get away with it. There have been many severe cases of migrant worker mistreatment in Kuwait and surprisingly, many of us are either unaware of these cases or under the impression that treating them like servants rather than human beings is ok. We feel it is our job is educate the younger generation about these issues so that Kuwaiti society can evolve into a more tolerable and respectful society. During our recent school visits where we presented about the treatment of domestic workers in Kuwait, we have opened a lot of young eyes about this issue. We are confident about maintaining that momentum and continuing to inspire more young people to take action and do something about this issue. MR: Do you engage any migrants in your efforts; for example, to have them speak about their experiences to Kuwaitis? Yes we do through our monthly cross-cultural diwaniyas. Every month, I open my personal diwaniya to people of various cultures and backgrounds where every month, we discuss a topic or two currently affecting Kuwaiti society in a certain way. The reason why the diwaniya is cross cultural is so that we can get varying opinions on said topics and take all viewpoints into account when discussing potential solutions to the topic at the end of the discussion. This also provides a platform for Kuwaitis and non-Kuwaitis to learn something that they didn’t know regarding the other culture instead of judging a person or culture through stereotypes. MR: Does the group also target the discrimination in laws and media? Yes, they are very critical when getting involved in human rights work in Kuwait, let alone migrant worker rights. We have been active for almost 3 years and we feel that we need to eventually take the next step in doing our part to instigate change in terms of the laws and regulations that are currently in place in Kuwait. One law that we have been extremely critical of is the Kafala (sponsorship) system for the domestic workers and we feel it is our duty to do our part in making sure that this ludicrous law is abolished. One of our upcoming projects is seen as a big first step towards getting involved in that field. Details about the project will hopefully be revealed within the coming months. MR: Can you tell us about your work on the issue of 'bullying' against non-Kuwaitis in schools and elsewhere? Bullying is an issue that both Kuwaitis and non-Kuwaitis are suffering from. The thing about Kuwait is there are social standards that you must adhere to when living in the country. If you act otherwise, you will be met with scrutiny from your peers along with being subject to verbal and sometimes physical abuse just for being different. The “you are either with us or against us” attitude here in Kuwait is what is badly affecting the youth that reside here. This is why every December; we host the Pink Friday walkathon, where we walk from The Scientific Center to Marina waves and vice versa while wearing pink. The whole point of this is to let people know that its ok to be different, regardless of nationality, religion, race, gender or way of life; people here really need to start judging people as exactly that: people and nothing more. This is why we are working on going into schools to give talks about this issue and implement it in the minds of the youth because all the problems start in the schoolyard. As a person who was bullied constantly as a child, I know how it feels to be treated like an outsider. I hope that I can use my experience to inspire kids to rise above bullying and be proud of being themselves. Follow Equait on Twitter and Facebook.